Members of Central Florida Community Arts’ Children & Youth Arts program will proudly present Seussical The Musical, Jr. on November 22nd and 23rd! Transporting audiences from the Jungle of Nool to the Circus McGurkus, the Cat in the Hat, our narrator, tells the story of Horton, an elephant who discovers a speck of dust containing tiny people called the Whos, including Jojo, a Who child who gets in trouble for thinking too many “thinks.” Horton’s challenge is twofold – not only must he protect the Whos from a world of naysayers and dangers, but he must also guard an abandoned egg that’s been left in his care by the irresponsible Mayzie La Bird. Although Horton faces ridicule, danger, kidnapping, and a trial, the intrepid Gertrude McFuzz never loses faith in him. Ultimately, the powers of friendship, loyalty, family, and community are challenged and emerge triumphant! 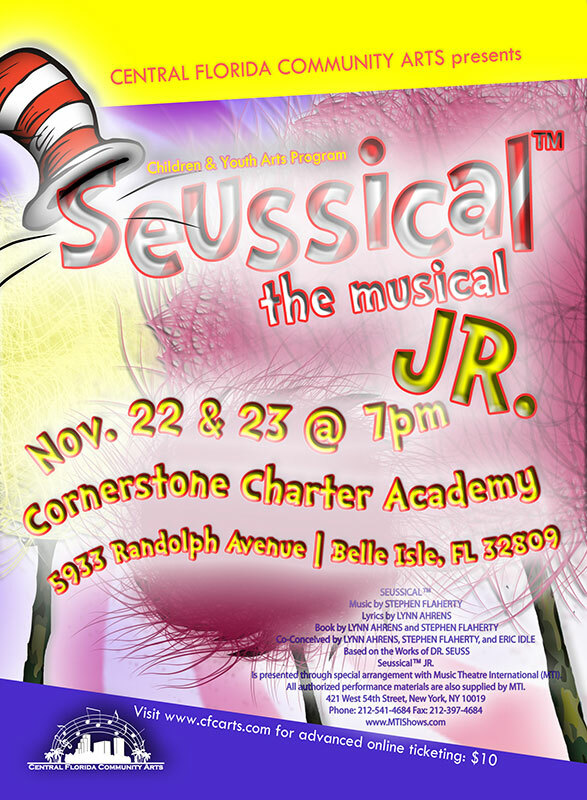 Seussical The Musical, Jr. will be held at 7:00pm on Friday, November 22 and Saturday, November 23 at Cornerstone Charter Academy, 5933 Randolph Avenue, Belle Isle, FL 32809. General Admission tickets are $10 each, and children age 3 and under will be admitted for free.